Collagen is the most abundant protein in the human body. This main component of the dermis helps the skin retain moisture. The content of soluble collagen decreases with age. Around the age of 35, the skin may start to lose its firmness and become more dry, while fine lines and wrinkles may start to appear. If the skin is supplied externally with natural collagen it substitutes the missing moisture. 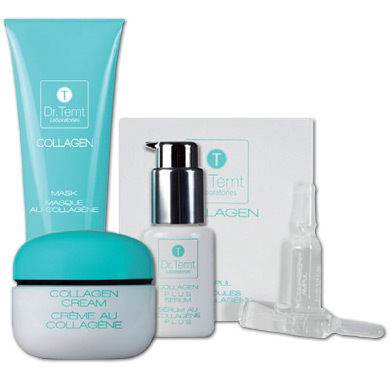 Due to this, Dr. Temt has developed the Collagen line, which improves skin’s elasticity and water content. Plant collagen is used to increase cell restoration and to firm the skin. The result is improved tone, elasticity and texture. This line is ideal for Mature and Dry skin types. A mild and gentle bar cleanser that contains natural plant collagen designed to improve elasticity and nourish the skin. A non-alkaline base soap with a pH of 6.4 maintains the acid balance of the skin protecting the tissue against bacteria. May be used twice daily. A cream mask that nourishes and improves the skin's capability to absorb and retain moisture. Includes a combination of natural ingredients that include plant collagen, corn germ oil, vitamin c and hydrolized elastin. Ideal use is once to twice per week. Apply a thin layer. Leave on for 15 - 20 minutes then rinse thoroughly with warm water. Concentrated treatment for deficient skin. This light gel ampoule contains the active element of plant collagen which improves the skin's elasticity, texture and hydration. The skin will feel smooth and nourished after usage. Recommended use once to twice weekly. For best results apply with steam. Treatment is elevated when the use of ampoule and mask are combined. Learn more about using ampoules. An exceptionally effective, light-textured serum containing a blend of Plant Collagen, Hyaluronic Acid, Olive Leaf extract and Edelweiss extract. The combination of these active ingredients boosts the skin's hydration level and protects against free radicals. Regular use improves texture and tone, leaving the skin feeling smooth, soft and moisturized. Ideal use is twice daily. Apply a thin layer after cleaning and massage into the face and neck area. All the serum to absorb for 5-10 minutes. Follow with moisturizer. Lightweight, moisturizing day and night cream combats the signs of aging. Ideally suited to promote suppleness and tightening in mature skin, but may also be used preventively on younger skin. Natural plant collagen, glycerine and almond oil work together to nourish, tone and smooth, leaving the skin feeling soft and hydrated. Includes a low UV protection factor for day use. After cleansing, apply to the face and neck area morning and night. May be used with Collagen Plus Serum (apply before moisturizing).